A weekly newspaper managed to beat a tight deadline and commemorate an Olympic homecoming with a souvenir edition thanks to a print swap slot with a sister title. 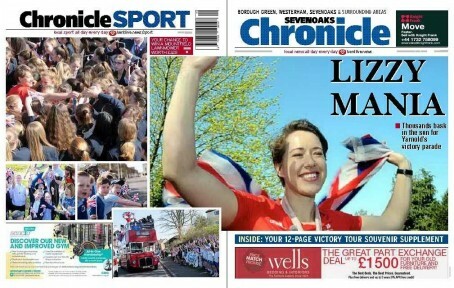 The Sevenoaks Chronicle marked a parade for record-breaking Olympian Lizzy Yarnold, the only Briton to win gold medals in successive Winter Olympics, with a front page wraparound and 12-page supplement. The parade started mid-morning on Wednesday and ran well beyond the paper’s usual 12.30pm deadline, but the Chronicle was able to swap printing slots with Trinity Mirror stablemate the Harlow Star in order to get the special on the streets. In addition to the supplement, TM’s Kent Live website ran a live blog from the bus as it toured the Sevenoaks area. Content editor Gabriel Shepard said: “There were a few hairy moments, not least that the bus was running 45 minutes late by the end. The Chronicle has long supported Lizzy’s sporting achievements having covered her from a rising teenage star of local athletics to her transition to skeleton and beyond. Sorry I meant 12 hours! Swap a print slot. Is that not just what papers do?